Hard water is a fact of life for many homeowners in the Willamette Valley. 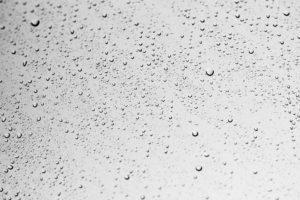 No doubt you’ve seen the white, hazy water droplets at times on your windows or shower doors. While it appears smooth, glass is a porous substance and the minerals in hard water can etch the surface leaving permanent marks. You can typically clean them up to a degree but positively removing them may not be possible if the stains have been there for a while. Here are some tips to prevent water spots. First , keep a small plastic squeegee in your bathroom and use it on your shower door after every shower (yes, each one). It only takes a few seconds and this will prevent the water from building up on the glass. Be sure to go all the way to the bottom of the shower so the stains don’t build up on the lower parts of the glass. Second, many new shower doors are available with a glass protectant applied at the factory to help them shed the water and prevent build up. Continuing to use a squeegee, however, will provide the best long term results. If you don’t have a glass protectant on your existing shower, after-market solutions are available at most home centers but will need to be re-applied every few months. Third, prevent your sprinklers from watering your windows when they should only be watering your landscaping. This is a common occurrence during the summer and usually requires replacement of the glass to completely repair. If it’s too late and your windows or shower doors are already etched with hard water, there are a few home remedies that may help remove them. I’ll tackle those in next month’s column. Reducing your home energy use not only helps the environment but can save you money as well. However, conserving energy is tougher during the winter since heating costs typically rise. 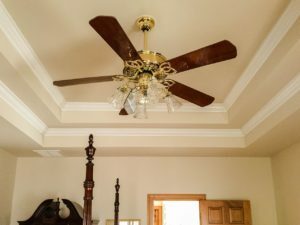 Here are a several tips to help you save energy – and money! – while still staying warm. Let the sunshine in! 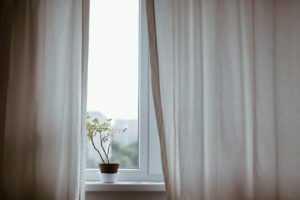 Opening your curtains during the day allows the sun to bring heat into your home through the windows. If you already have energy efficient insulated windows they will help to keep some of that warm air inside. Be sure to close the curtains at night to minimize the heat loss. Adjust your thermostat at night. The Department of Energy estimates you can save 10% per year by turning your thermostat down 10-15 degrees at night. A programmable thermostat will do this for you and you can set it to raise the temperature in the morning so you won’t have to climb out of a warm bed into a cold room. Throw an extra blanket on and let the savings add up! Get your furnace serviced. Change the filters regularly so your furnace can perform at it’s optimum, money-saving best. The harder it works, the more money you spend. A little preventive maintenance will pay dividends in the long run not only on your heating costs but your appliance will last longer too. Prevent leaks. Drafty windows and doors are uncomfortable and expensive. Look for areas where old caulking may need to replaced and seal those joints. You may even need to consider replacing your windows and doors if they are old and inefficient. If so, the Energy Trust of Oregon (energytrust.org) is a good place find out about energy saving weatherization products and check out any rebates that may be available. With a little effort you can reduce your energy costs this winter and still be comfortable.